46:28 This recalls Jacob’s reunion with Esau. When we read these passages and find them familiar there is a reason for that. 46:31 Joseph is prepping his family for a life in Egypt – and wants to protect them – but at the same time they will be a foreign group within the Egyptian polity. There are, accordingly, the seeds in place for the future conflict between God and Pharaoh. There is dramatic foreshadowing here. LL: Note the footnote mention of the Hyksos – there has been recent archeological evidence suggesting that they may be the progenitors of the Israelites. SF: Phillip Johnson refers to the Israelites as a “warlike tribe.” PG: Based on what? This is a constructed history but basically there is very little to go on. Walter Benjamin, a Jewish thinker from the early part of the 20th C. noted that descriptions of wars written by the victors always exaggerate the power of the other side. Here we are not concerned with the actual history – which is unknown – but why the account is structured in this manner. Why does Abraham leave Ur? Why is it important that the Israelites have this sojourn in Egypt? There is considerable extra-biblical evidence for the Babylonian exile. The Torah as we know it today was assembled after the return from Babylonia. The ability to survive exile is central to the story of Judaism. See the book “Etched In Stone” where the author argues that the concept of Sinai and Moses was developed after the return. However, something was there that allowed a people to cohere and survive after two full generations – completely disconnected from what had established them as a people. Both the monotheism and the sense of covenant were significant factors in the retention of cultural identify. Note that this was not “law” received from a king – such as Hammurabi – but rather received by an entire people from God. It is revolutionary that every individual – including the kings – are subject to this law. SF: Rabbi Feldman speaks of eternal and transcendent truth that we connect to – beyond our temporal psycho-sexual references. PG: If we wanted to treat this merely as story-telling we miss the meta-messages of the construct. We are attacking the text from both sides: by value free investigation and by faithful acceptance of the text as it is presented. “Wiesenshaft” is the German word for the notion of analysis by value free neutrality. This approach is very difficult because we all carry baggage – it is a high wire act with no net. Nachum Sarna compared the literary quality of the Bible to Greek poetry – in the sense that the telling of the stories is done by and to people who already know what is going to happen. The pleasure is in the repetition. LL: And in the analysis. PG: Compare the thinking of Irving Kristal – the founder of neo-conservative thought. There is an advantage of clarity to a didactic position. Consider Joe McCarthy’s anti-communism. You knew exactly where he stood. How does a people maintain its cultural identity? It may be no more than retention of a family name. Recall that Moses was mistaken for an Egyptian because of his clothing and appearance. This issue of identify was critical during the first one hundred years of the modern era. There were several answers ranging from Qumran to rabbinical Judaism. And there are several answers to this day. 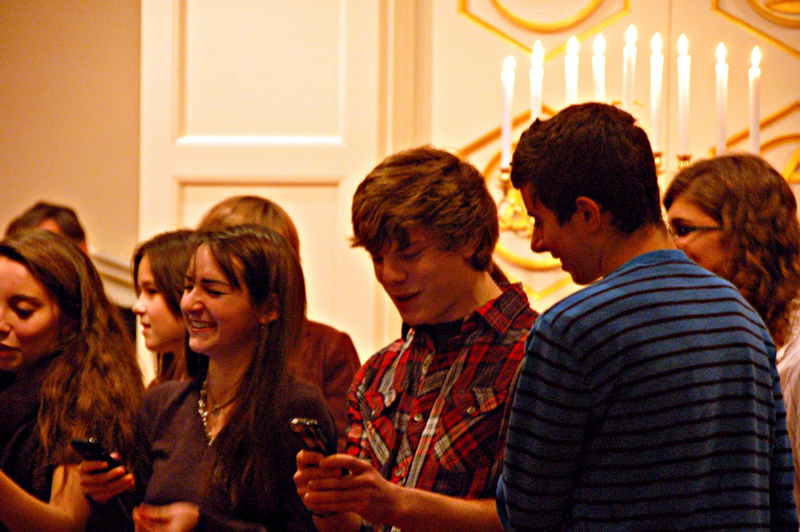 Members of Vassar Temple gathered on Friday evening to celebrate the fourth night of Hanukkah. 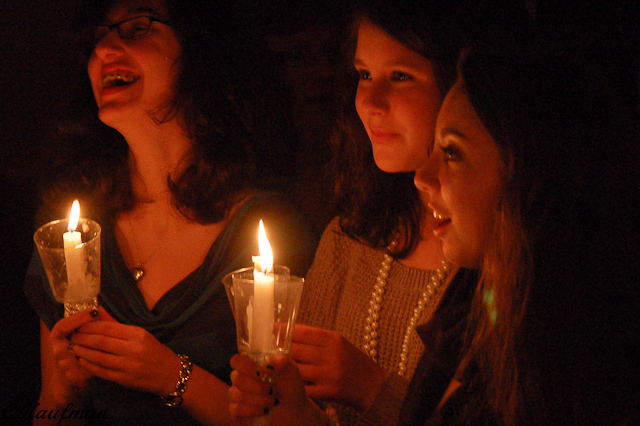 A well-attended celebratory pot-luck dinner preceded a festive service featuring a candle-lighting ceremony, led by the post-bar/bat mitzvah students, and a rendition of “Candlelight,” led by the older high-school students. The attendance for Seth Erlebacher’s funeral service filled Vassar Temple; not just the expanded sanctuary, but virtually the entire building. Rabbi Richard Jacobs, newly installed as President of the Union for Reform Judaism, came and extended condolences on behalf of the entire Reform Movement. Colleagues from IBM came and spoke not only on behalf of their department, but also for IBM employees around the world who had been touched by Seth’s leadership and friendship. The synagogue was filled, but it represented just a small portion of those who were banded together in mourning. Young or old, all deaths reverberate through a population. Some, however, make a much greater impact than others. Seth Erlebacher clearly touched on the lives of an extraordinary number of people, from those, such as his family who knew him intimately, to individuals who were unaware of his existence and yet benefited from his technical skills and personal generosity. I believe that the principal reason for this impact is Seth’s innate integrity. “Integrity” pertains to a sense of internal oneness; the ability to meld together the distinct and diverse elements of one’s life into a consistent and reinforcing whole. Seth’s life could be characterized by this integral consistency. For twenty-three years, upon his arrival in the Hudson Valley, he brought together family – Melissa, then Rachel and Brianna – work at IBM and participation in a Jewish community through Vassar Temple into a virtually seamless unity. Nothing was fully divided out. Jewish life permeated both home and synagogue. Love of family underpinned devotion to friends, colleagues and community. Technical precision and professional care was brought to bear at both work and volunteer activities. In the Book of Proverbs one reads: The integrity of the upright (tzaddik) guides them. What makes one upright? It is precisely one’s integrity! Seth was truly a tzaddik. The passage of time allows individuals and communities to overcome loss and readjust the new circumstances that the loss has brought about. In due time, we will all get along with the rigors of living. But, make no mistake: Seth’s presence in our lives, however brief in the greater scheme of things, has made a profound impression. Each one of us is better off for the blessing his life bestowed upon us. And each one of us will feel is loss to the end of our days. Today I buried a friend. In attendance at the funeral with me was the president of the largest movement of Jews the world has seen; other clergy; representatives of neighboring communities; members of various intersecting business, social, and religious circles; friends; and numerous acquaintances. Toward the front were his grieving parents, wife, and two teenage daughters. I met Seth only a few months ago, in his capacity of Temple President, at a meeting of three concerning the religious school and whether I would run it. We talked about vision and salary, education and culture, supervision techniques and attendance policies, work hours and commuting distances. Follow-up discussions were devoted to health insurance, keys, voice mail, computers, e-mail, security codes, and myriad other details related to a new job. The job interview is always an odd way to meet someone, and this was no exception. By the time the process was concluded, I knew where Seth stood on everything we’d discussed — he preferred to lock the door before arming the alarm, for example, and he was adamant that e-mail addresses should be part of the Temple’s branding — but I didn’t know who he was. Seth was always around the Temple, though, giving us lots of informal opportunities to talk in addition to our formal meetings. We discussed mundane matters like budget lines and teacher salaries, and lofty goals like how to foster Jewish commitment. I remember one particular day I came to Seth when I discovered what could have been a huge problem. He responded with a cheery if ironic one-word answer: “excellent!” His simple reply was laden with complexity. We’ll fix this together. We won’t let it stand in our way as we build for the future. And for sure we won’t let it stop us from having fun now. Seth and I talked about the school, of course, and the Temple, about summer camps and the future of the Jewish people. 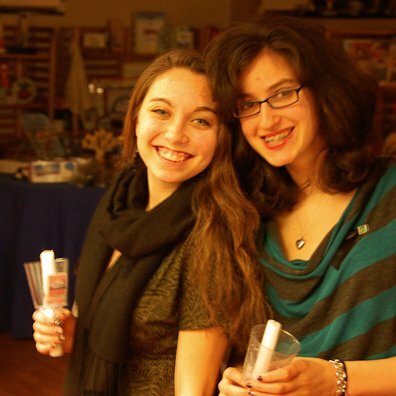 We celebrated Shabbat together. We mocked the ineptitude in the world (sometimes, sadly, our own), chatted about current events, and planned for a better tomorrow. Six months ago I met the Temple President. It is with profound sadness, regret, and shock that we must inform the congregational family of the sudden, unexpected death of our beloved Temple President, Seth Erlebacher, on Friday, December 16, 2011. As we mourn Seth’s passing, let us all keep Seth’s family in our prayers. The funeral service will take place on Wednesday, December 21, at 10:30am at the Temple, followed by interment, then a minchah service back at the Temple. 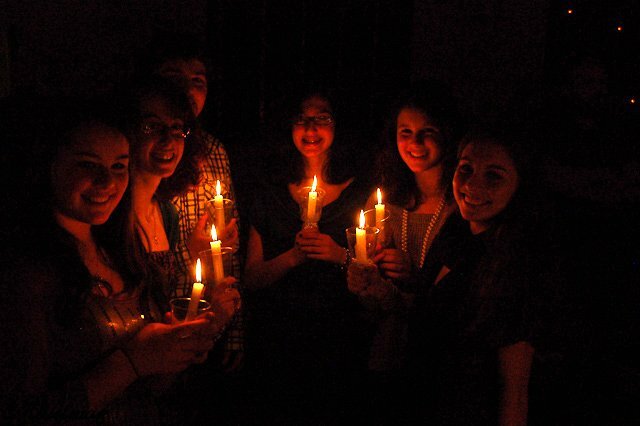 Shiva minyan services will be held Thursday and Saturday evenings at 7:00pm. The family will rise from shiva Sunday morning.